Each solution has its pros and cons. And it depends on your business goals which one is best for you. 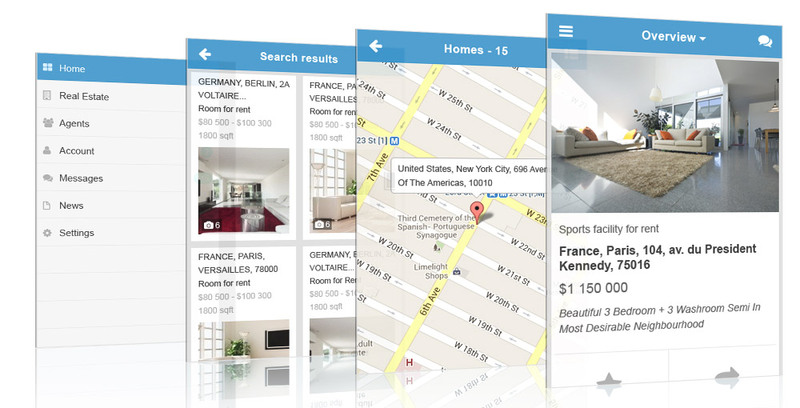 PG Real Estate supports both mobile version and mobile applications. Being essential part of the standard functionality of a real estate site, the mobile version comes with the real estate script package. It does not cost extra. If you own a real estate site built on PG Real Estate, mobile version is a fast and easy way to establish mobile presence. No separate installation is required. Site main settings (categories, types of operation, colors, etc.) synchronize with the mobile version. These packages are encrypted. The number of publications corresponds to the number of purchased applications. This package is open for modifications. The number of publications is unlimited. However, we help to publish only one application for every store (Apple and Google). We cannot guarantee successful publication of customiseded application. Technical documentation is currently available in Russian and English languages. Demos of the mobile applications are available on App store and Google Play. Your comments and rating will help the applications get better! Register or login with your App ID at https://developer.apple.com/register/index.action and join iOS developer program (paid membership). The procedure is necessary to be able to upload applications and distribute them. Register or login at https://play.google.com/apps/publish/signup/ and go through developer console steps. 4) Publication of the applications. You can publish them yourself (we will provide you with the appropriate files) or send us access details to your accounts on iOS Dev Center and Google Play. Note: Android applications are usually approved on Google Play within a day. iOS applications approval may take up to 1-2 weeks.